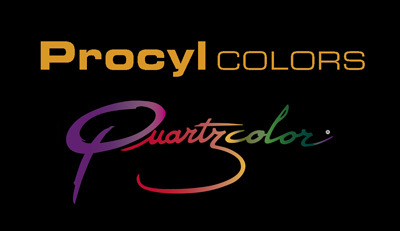 Procyl-COLORS also manufactures natural silica mortars, as well as specially designed technical products like Procylum®, a photo-luminescent quartz that absorbs light from natural or artificial sources and is capable of remaining luminous for close to 5 hours. It is particularly suitable for applying safety markings to the ground in businesses and around local communities, with the quartz equally able to provide a touch of originality to decorative flooring. Stone carpets and decks, wall coverings, mortar and broadcast systems are all proposed in a multitude of colours and finishes. The Quartzcolor® range offers you every possibility to personalise your demand, for both interior and exterior surfaces. Quartzcolor® consists of natural coloured quartz that is mixed with epoxy or polyurethane resin in order to create seamless floor and wall coverings that are extremely resistant, with a thickness which can vary between 3 to 10 millimetres. A unique and innovative product, Quartzcolor® brings together visibly decorative qualities with exceptional features such as variety, strength, mechanical resistance, resistant against scuffing and protection against fading from UV rays and chemical agents. Sturdy and long-lasting, it boasts outstanding thermal, antistatic and acoustic performances, while offering you a perfectly seamless finish. Quartzcolor® has been used in the industrial market for several decades, thanks to its powerful resistance 6 times higher than concrete, its thin layering and its ability to be applied to any type of surface, which makes it especially suitable for renovations.